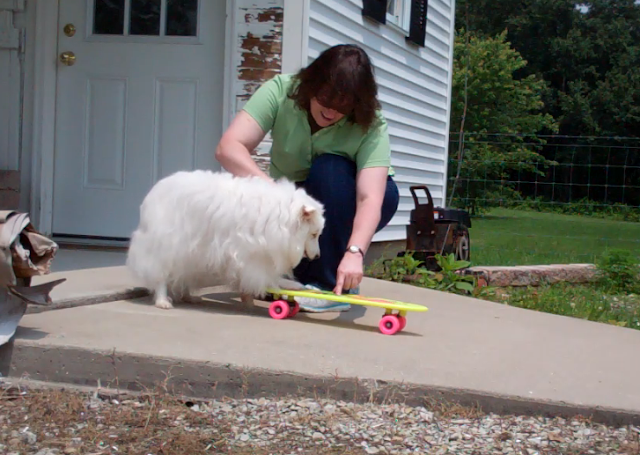 White Dog Blog: Treasure's newest tricks! Treasure continues to learn new tricks. 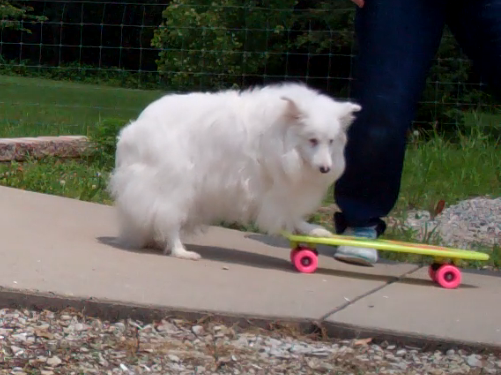 She has perfected pushing her skateboard, and she really seems to enjoy it. She steps onto it eagerly, while I hold it still for her. Once she's in position, she starts pushing and away she goes. Once she gets off, she can't wait to step back on, so I have to be quick to pick up the board and take her back to the starting point so she can go again. Of course, I stay nearby to make sure she doesn't run into anything or go off the side of the walkway. And I can stop the board if there is any danger. I have found that in addition to being a cute trick, this exercise helps to strengthen her rear legs, which helps with her fitness program! The piano was easy for Treasure because she likes to step on new surfaces, but when she would stand on it, she tended to then just stay in one place instead of moving her feet around and making music. 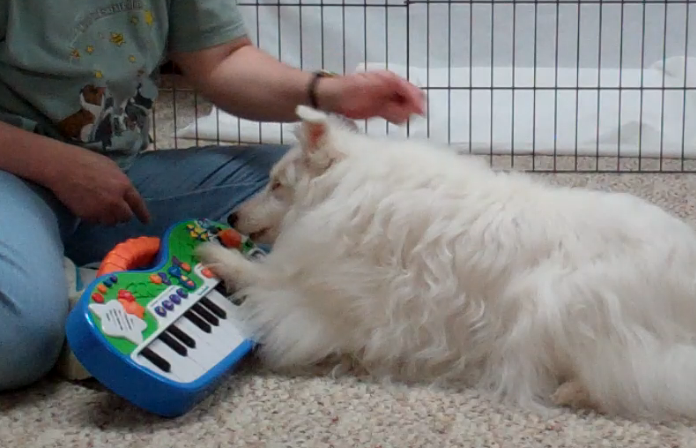 So I decided it would be better to teach her to play while lying down so she could move her feet more easily. Well, let's just say that although Treasure does humor me (she likes those treats, you know! ), she does prefer to play standing up when she gets the chance. Perhaps one of the hardest we've accomplished so far is targeting the easy button. The smaller size of the button compared to other surfaces I've asked Treasure to step on or touch, made it much more difficult for her to pinpoint where in space it was and how big it was. We tried many different techniques. Some resulted in her pawing the air repeatedly, trying to locate the button. Together we discovered that if neither she nor the button moved, she was able to find it much easier. So, with her lying down (so she didn't move), and the button next to her foot where she could feel it, she was able to target it easily. I think this may now be one of her favorite tricks. Every now and then she will miss the button, but she tries again until she gets it. 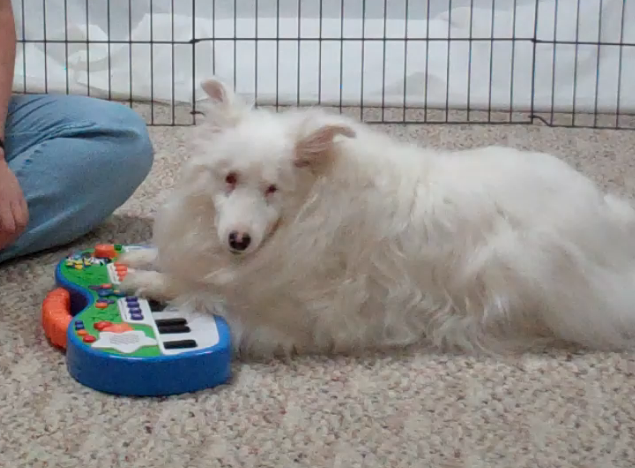 Treasure and I would love to hear what new tricks your dogs are learning! Tricks are a great way to have fun with your dog, and to keep your dog active and stimulated. Some tricks even help provide great exercise! Happy tricking!